Our franchise attorneys walk you through the entire franchising process—from start to finish. And once your franchise system is up and running, we’ll be there as you sell franchises. Franchising your business requires complying with complicated state and federal laws that regulate the ‎sale and advertisement of franchises. We advise franchisors on structuring their ‎franchise systems, document the franchise system in Franchise Disclosure Documents, Franchise ‎Agreements, and ancillary contracts, and register the franchise offering in states that require franchises to be registered ‎before they can be offered or sold. ‎Then, we help you manage your relationships with franchisees once your franchise system is up and running. If you are considering franchising your business, contact us for a complimentary, no-obligation initial franchising consultation. You can talk ‎with our experienced attorneys to see if your business can be franchised, and the process to ‎do so. To get the most out of this meeting, first complete our Fit to Franchise assessment and thoroughly review the other ‎materials on this website. We will review the results of the Fit to Franchise assessment with you, describe the process of franchising, and answer any questions you may have regarding franchising. After our complimentary initial franchising ‎consultation, we’ll prepare a fee proposal for franchising your business, generally including a flat fee for our services (including state filing fees), so you can budget properly without fear of surprises‎, and lay out a detailed timeline. If you decide to start franchising, we will gather detailed information from you on your company, your brand, the products and services you provide, and the structure of the franchise system. We will give you a detailed questionnaire to fill out on all aspects of your to-be-formed franchise system. other legal matters required for the FDD, Franchise Agreement, and ancillary contracts. We can also recommend experienced franchise consultants to assist you in preparing an operations manual for your franchise system (which explains the ins-and-outs of operating an outlet) and developing training programs for franchisees. However, many franchisors develop the manual and training program internally. One of the most important parts of a franchise system is the brand and trademark that is ‎licensed by the franchisor to the franchisees in exchange for fees, and under which the franchisees operate their ‎franchised outlets. The brand name must attract customers, but it also must be one you ‎can ‎prevent competitors from using. The name must be unique. Larkin Hoffman’s ‎intellectual property attorneys can help you find and/or federally register a name that is strong from both a ‎legal and branding standpoint. If you are already using a brand name for your business that you would like to continue using for the franchised outlets, we’ll federally register the name if it isn’t already. Before registering a trademark, our intellectual property attorneys will ‎conduct a nationwide ‎search to find out if others are using the same or a similar ‎name. Most likely you are already using a brand name for your business and will want to franchise under this brand name. The trademark search will determine whether you can use this brand name and in which markets (or nationwide). If the name appears to be available—because others aren’t currently using it—we will register your mark under federal law. While many state laws permit registration of trademarks, a federal trademark registration locks in your right to ‎use the name nationwide and is therefore better for franchising. A “trademark” is a word, phrase, symbol, and/or design that identifies and distinguishes the source of the goods of one party from those of others. A “service mark” is a word, phrase, symbol, and/or design that identifies and distinguishes the source of a service (rather than goods). The term “trademark” is typically used to refer to both trademarks of goods and service marks of services. A federal trademark registration secures the right to use the name nationwide and is therefore better for franchising. A federally registered trademark provides prima facie evidence of ownership and grants you the exclusive right to use the mark nationwide in the classes registered. Once licensed to franchisees, franchisees can operate under the trademark. If a franchisor registers a federal trademark, the franchisor doesn’t need to register its franchise offering in any of approximately 36 states requiring the registration of “business opportunities” (business opportunities are broader than franchises, but include franchises). Based on the information we collected from you, we will prepare initial drafts of the Franchise Disclosure Document, Franchise Agreement, and ancillary contracts. Often, first-time franchisors may not have all the information that is normally necessary to draft these documents. Never fear—we will “fill in the gaps” based on our 40+ years of experience and information from current surveys of the industry. We will then give you our initial drafts of the FDD, Franchise Agreement, and ancillary contracts for your review and comment. Then, once you’ve had a chance to review the documents, we will coordinate an in-person or phone meeting to walk through in detail each provision of the documents—so you understand both why certain information may be required by law or to protect you, and how your franchise system would operate. Based on your feedback on the initial drafts of the FDD, Franchise Agreement, and ancillary contracts, we will prepare the final drafts of the documents and provide the documents to you in various formats. We’ll form a new business entity (typically a limited liability company or ‎a Subchapter S corporation) which will serve as the “franchisor” in the franchise system, own ‎the trademark(s) and other intellectual property (or at least have a license to further ‎sublicense the same to franchisees), offer and sell franchises, and provide franchise training ‎and support services. Further, with a separate franchising company, you can significantly reduce your financial audit ‎costs as required by federal and state franchise laws. Specifically, Item 21 of the Franchise ‎Disclosure Document requires that you include audited financial statements for the past 3 ‎years for the franchising company. If you create a new business entity for franchising, the ‎initial audit would be conducted by your accountant on a new company without operating assets or ‎liabilities and not on a currently-operating business entity that might own and operate a few ‎company-owned stores, thereby significantly reducing the costs to prepare financial ‎statements. Also, Item 21 only requires audited financial statements from the inception of the ‎franchising company, and so you don’t need to disclose 3 years of history initially. Then, in ‎subsequent years, when you renew your franchise filing, your accountant would only need to ‎audit the franchising company and not the business entity owning and operating the company-‎owned stores. This reduces time, costs, and the amount of information you have to publicly ‎disclose. 14 state franchise registration states and 5 business opportunity states require registration of your franchise offering with the state before you can offer or sell franchises in that state or to residents of the state, and 7 additional business opportunity states also require registration unless the franchisor has a federally registered trademark. We will prepare the paperwork necessary to file and register your Franchise Disclosure Document in the states where you are franchising. Sometimes the state agency that processes the filing may reject it for one or more reasons through something called a comment letter. We will address any comment letters sent by state agencies. The registrations are good for one year (see Step 7 – Annual Renewals & Amendments). In the beginning, you don’t have to file or register your franchise offering in the registration states where you don’t intend to franchise until such time as you find franchisees in those states. However, wherever you do decide to franchise in those states, you must have an FDD that complies with the restrictions, disclaimers, etc. required by state and federal law. A couple of states also require that any advertisements used in the offering or selling of franchises must be filed or registered with the state before those advertisements can be used. Sometimes the state must also approve the advertisement itself before it can be used. And a few states have specific disclaimers or other information that must be included in any advertisements. While this sounds complicated, we are used to dealing with these regulations in any state, and will review and, if needed, revise any advertisements, and file or register them with any states that require it. Now comes the fun part! 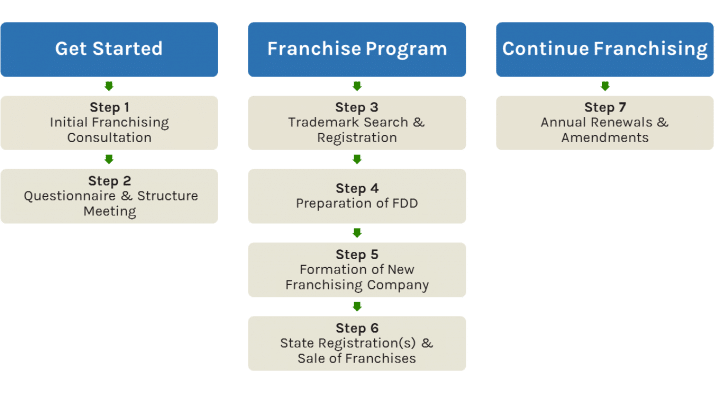 Once your franchise offering is registered where required, and you have an updated FDD, Franchise Agreement, and ancillary contracts in place, you can start offering and selling franchises in the registration states where your franchise offering is registered as well as in the non-registration states. There are certain laws about how you can sell franchises that we’ll help you navigate (including one applicable in each state requiring you to provide a copy of the FDD, Franchise Agreement, and ancillary contracts to prospective franchisees a certain number of days before the prospective franchisees can buy the franchise). To continue franchising (meaning, selling franchises) after the first year, you must file renewal applications in several registration states, ‎usually within 90-120 days of your company’s fiscal year end. The renewal applications require you to update and file your Franchise Disclosure Document. The timeframe between filing a ‎renewal application and the state granting the renewal ranges anywhere from immediately to a ‎few months, depending on the state and the specific circumstances. Sometimes, a state may reject a renewal application for one or more reasons; we will respond to those states to ensure that the renewal application is accepted. In all other states, you still have to update your FDD annually to continue offering or selling franchises. All information in the FDD must be updated at least annually, and certain new information must be provided each year (including audited financial statements and the number of units existing as of the end of each fiscal year). If a material change or event occurs in the franchise system or with the franchisor, state and federal law also requires you to update your FDD and file it with certain states within a certain time period after this material change or event occurs—even if your franchise offering is not yet due for renewal. Also, as mentioned in Step 6 – State Registration(s) & Sale of Franchises, if state law requires it, we will file and register, with the appropriate state agencies, any advertisements used in the offer or sale of franchises. Filing of advertisements can be done at any time during the year, provided, they must be filed prior to being used in a handful of states. "The expertise and access to key legal information and advice that the Larkin Hoffman firm brings to the table provided us with a comprehensive blueprint of how to launch our franchise concept."